Yesterday, the bus tickets to Sokcho (a city close to the border with North Korea) were almost sold out. The news about Pokemon Go was rapidly spread out to people in Korea through various social media. Actually, it was impossible to play that game because of some issues of using Google maps in South Korea. But, Pokemon is found in Sokcho!!! As you can see the map above, the yellow areas are restricted to play Pokemon Go but the pink triangle zone (Sokcho) is the only location that people do catch Pokemon in South Korea. Sokcho is too close to the border of North Korea, so some experts explained that Sokcho has not been classified as South Korea territory. Luckily (maybe?) we are now allowed to play Pokemon Go in South Korea but we have to go to Sokcho to play it. It takes almost 3 hours by car or bus from Seoul to Sokcho. But people are now heading to Sokcho to meet Pokemon through using their smartphones. In accordance with the global Pokemon Go fever, the city hall of Sokcho prepared the Pokemon special package hastily. It provides the map of free wifi zone for Pokemon Go players who visit Sokcho city on its Facebook page and Twitter account. (see https://www.facebook.com/dreamsokcho/) Also there is a Pokemon Go team page (https://pokemongoclankorea.herokuapp.com) that allows Korean Pokemon Go players to join three different team group from all over the world to share information about Pokemon Go such as game tips. And the social commerce such as Tmon (ticketmonster.co.kr) sells the special shuttle bus package from Seoul to Sokcho for Pokemon Go hunters. People can purchase cheaper price of shuttle bus tickets through this social commerce website by using their smartphones. I cannot go to Sokcho right now but I still can see and read other hunters’ stories and photos through social media. Oh!!! and I can’t catch Pokemon because they didn’t visit Seoul for this time, but I can ‘find’ or ‘catch’ Yakult Ajumma through using Yakult Ajumma app on my smartphone. 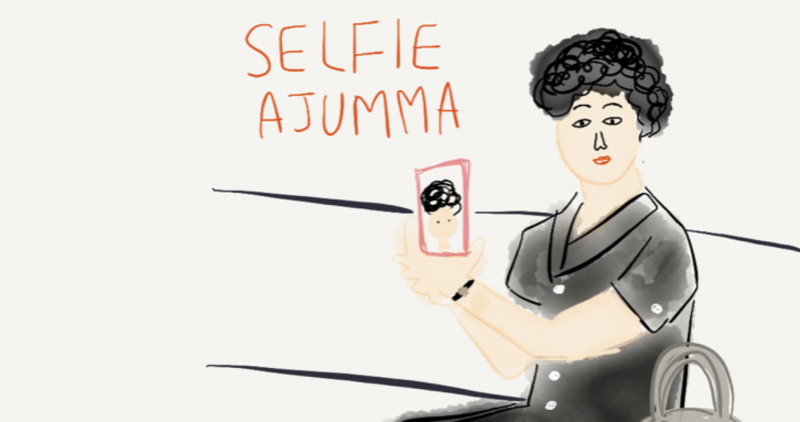 Posted on 14 Jul 2016 14 Jul 2016 by moon ajummaPosted in 스마트 아줌마 (한국어), My note, Smart Ajumma (English)Tagged AR game, 게임, game, 속초, 포케몬고, 한국, Korea, mobile game, pokemon, pokemon go, pokemon go south korea, smartphone, sokcho, south korea, Yakult, Yakult ajumma.